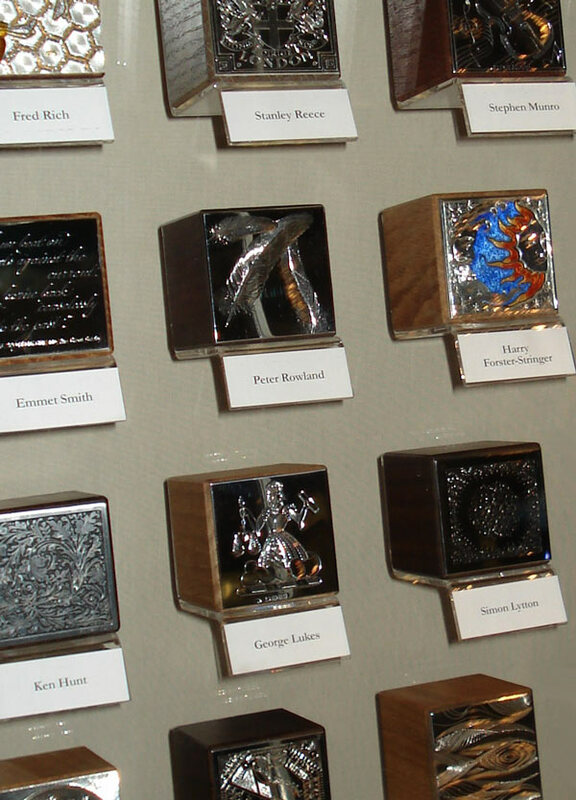 The Paperweight Collection is The Hand Engravers Association of Great Britain’s living record of contemporary hand engraving, created by its members. It is on permanent display in the Clockmakers’ Museum, within the Science Museum in London, one of the finest collections of clocks and watches in the world. You can view the Paperweight Collection online in our Paperweight Gallery. Most hand engraving is carried out on someone else’s work, i.e. it is the client’s job. Often the engraver is not credited, is rarely recorded and therefore the status of practitioners, the quality of what they do, slips through the net of public awareness. The Association welcomes practitioners of all ages and at all stages of their career. In this collection visitors will see those just starting out, those who run busy practices and those who’ve been working a lifetime. Gun engravers, inscription engravers, carving and engraving for champlevé enamel, traditional forms, contemporary forms – all are permanently recorded here for the first time. We hope this collection will create interest from those unaware of the wonderful, high level of skill held in the UK for centuries and still practised today. We hope it may also inspire some to take it up seriously carrying the tradition on into the future.